The Kodak Playfull Ze2 is a great little video camera for $99 USD or less. What it lacks in quality and features it gains in versatility thanks to its lifeproof specifications. We found that overall quality is good, with only a few annoyances. Read more in our Full Conclusion. Kodak's Ze2 builds upon their Playfull line of compact digital video cameras, with the addition of some appealing Lifeproof features. Like past models, the Ze2 is a fixed lens video camera that can record 720p HD video, along with 1-megapixel still images. These files are the perfect size for sharing on social media sites like Facebook, and Kodak has included some handy features to help you quickly and easily upload your video and photos. Additional features include waterproof, dustproof, and drop-proof specs, simple to use interface and controls, f/2.4 aperture to help you capture better video in low-light, etc. 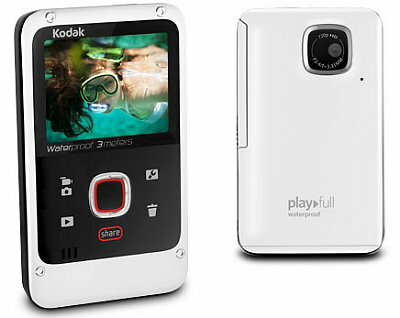 The Kodak PlayFull Ze2 is available now with a MSRP of just $99.95 USD. See our buy box below for the most current online pricing at various vendors.